Happy Hump Day! I have another card for you today using the hilarious Cheesy Pick Ups stamp set from Jaded Blossom! This sentiment says I'm new in town... Can you give me directions to your place? (Click on image to make it larger). 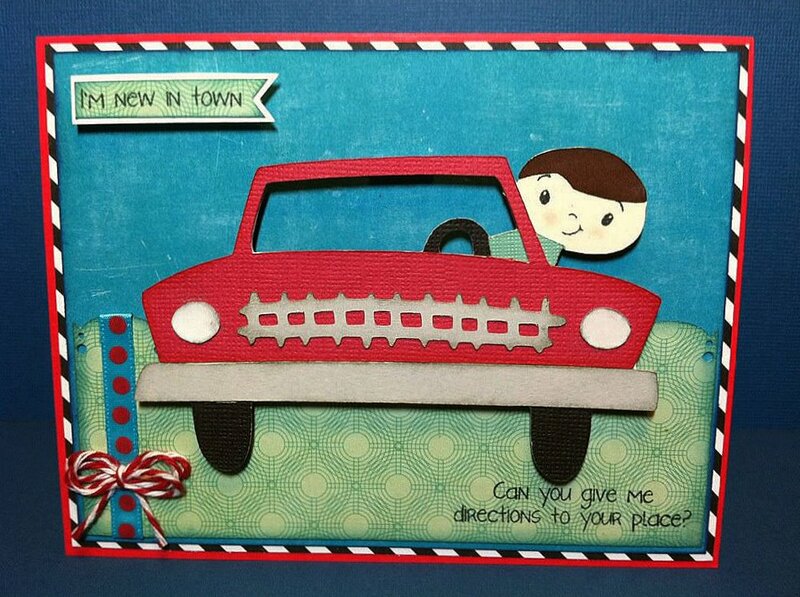 I used Echo Park Papers for the card and the car and guy were cut from Beep Beep cricut lite cartridge. I also used a Peachy Keen face on the guy. Thanks for checking out my blog today! I love this card! The image is perfect with the sentiment! His face is perfect! He looks like he is giving someone "the eye!" I love this card!!!!!! LOL that is so cute. Love that image for that sentiment. Really cute. Love the that stamp set I think that will be my next purchase. And I love the cricut cut you used. I really love this card!!! SUper CUTEEEE!!! That car and the little guy are just too perfect for your sentiment!!!!! thanks for making it so cute and making me spend my money in buying this cartridge !!! Jaded Blossom Stamp Release Blog Hop!! !